Chongqing Taisun Pharmaceutical Co., Ltd. Product categories of Plant Triangular Leaves Coptis, we are specialized manufacturers from China, Plant Triangular Leaves Coptis, Plant Triangular Leaves Coptis suppliers/factory, wholesale high-quality products of Plant Triangular Leaves Coptis R & D and manufacturing, we have the perfect after-sales service and technical support. Look forward to your cooperation! (Triangular leaf Coptis) Ranunculaceae, Coptis. Rhizome yellow, internodes obvious, mostly densely rooted, with transverse stolons. Leaves 3-11; leaf blade ovate, slightly leathery; petiole glabrous. Scapes yellow-green, narrowly ovate, apical apex; petals nearly lanceolate, apex acuminate, Middle slightly widened, with honey groove; stamens long only about 1/2 of the petals; anthers yellow, filaments narrowly linear; style slightly curved. Oval oblong, carpels stalked puberulent. March-April flowering, April-June results. Specialty Chongqing pillars yellow water. Health elevation of 1600-2200 meters between the mountain forest, often cultivated, wild rare. 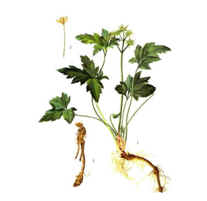 Rhizome is a famous traditional Chinese medicine ("Coptis"), with berberine, Coptidis base, Coptis base, tetrandrine and other alkaloids, can cure acute conjunctivitis, acute bacillary dysentery, acute gastroenteritis, hematemesis, Embolism. Copyright © 2019 Chongqing Taisun Pharmaceutical Co., Ltd. All rights reserved.